Olympics Biathlon. How can they do it? Olympics Biathlon presents a mystery. How can an individual shoot at a target the size of a golf ball 50 yards away, 5 times in 25 seconds, and expect to hit it, after racing on cross-country skis around a track at top speed for 4 km. That boggles the mind. Olympics biathlon has been part of the winter games since 1958, but it has been a way for hunters in the north to find meat for well over 4,000 years. It has also been used by countries at war as recently as WW II. They began to be used to defend themselves from the enemy as far back as the 16th century by the Scandinavians. The word Biathlon comes from the Greek word for two tests. Today, the biathlon consists of ten separate competitions combining the two skills, cross-country skiing with target shooting. The object of the exercise is to complete the course in the shortest amount of time, while hitting as many targets as possible to avoid penalties such as extra time or extra skiing. The Olympic biathlon became an Olympic event in 1960 and was introduced in the 1962 Olympics in Squaw Valley. 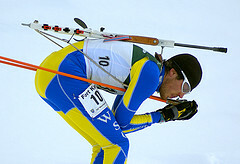 Women’s biathlon competition became part of the 1992 Olympics at Albertville. The racers start in the stadium 30 seconds apart on a 3 (women) or 4 km (men) trail. Of course the trail goes up and down hills and turns and then ends back at the stadium where there is a rifle range set up. There they must put down their poles and either prone or standing, aim and shoot at five targets. The bulls eye for the prone shooter is the size of a golf ball. The target for the standing shooter is the size of a large grapefruit. If they miss a target, one minute is added to the score, or, they have the option to ski a penalty lap on a 150 meter loop. The athlete usually shoots the five bullets in about 25 seconds. Then they get up, sling their rifle onto their backs and go around and do it all over again. The competition is comprised of five different categories. The Olympic biathlon individual start event of the men is 20 km and the women 15 km. they have a staggered start 30 seconds apart. The men ski their 4 km loop 5 times and the women ski a 3 km loop 5 times. Each time they complete a loop they must stop at the range and shoot five targets. The penalties for missing stay the same for each event. One minute peer miss or a 150 meter penalty loop. This is similar to the individual start with the same staggered 30 second interval. The women race 7.5 km (3 laps of the 2.5 km loop) and the men do 3 laps on a 3.3 km loop for a 10 km total. All racers stop twice to fire 5 shots at the range with the penalties the same for missing a target. In the Olympics biathlon, the top 60 finishers in the sprint event will qualify for the pursuit event, where everyone chases the winner of the sprint competition. In the Pursuit, the competitors start at intervals based upon their finish time in the sprint competition. The winner starts first, and then everyone else based on how many seconds behind the winner they were in the sprint competition. Women race 10 km (5 laps of the 2 km course) and the men 12.5 km ( 5 laps of the 2.5 km loop). All racers must stop four times at the range for 5 shots as per the other race competitions. The first racer across the finish line is the winner. For the relay event, one by one, each member of the team of four skis one leg (7.5 km for men and 6 km for women). Once across the finish line the tag is made and so on for each lap. The shooting is different for this event. Each racer is allowed 3 extra bullets. Penalty for missing is the sam as before. In this Olympics biathlon competition, the women race 12.5 km and the men 15 km. the top ranked 30 racers start together and must stop to shoot their 5 shots at the range 4 times. Penalties are the same. If a competitor gets lapped during the competition he or she is finished and withdraws from the competition. The first racer across the finish line is the winner. The Olympics biathlon rifle is a .22 caliber, straight pull bolt action model with non-optical sights. It is fitted with a harness for carrying while skiing. The stock is custom made and ultra light and is totally dissimilar to a hunting rifle. The minimum weight is 3.5 kg (7.7 pounds). Note the extruding ammo clips fust forward of the breech. These rifles are perfectly adapted for their purpose. The arm sling is a belt attached to the rifle stock that fits into the shooters shooting cuff on the upper arm to steady the rifle while in the prone position for firing. This is the custom made harness used to carry the rifle on the back while skiing. This is a cap that fits over the rifle muzzle to prevent snow from entering into the barrel while skiing. It is flipped open before firing. In the relay race, eight bullets are carried in each clip. Five are loaded in the usual way and three extra rounds are carried in the clip base. They are there for hand loading. If needed they are available. Nearing retirement? Are you ready for it? Want something exciting to do? The Olympics Biathlon races will be held during the 2010 Vancouver Games at the Nordic Ski Venue at Whistler. 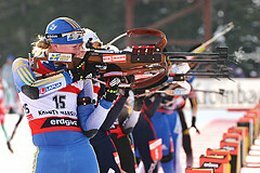 Biathlon news, training, rules and great information.